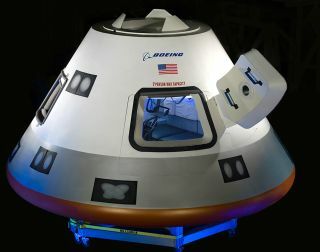 A mockup of Boeing's CST-100. COLORADO SPRINGS, Colo. — Mobile tech and apps designed for astronauts could make a fresh appearance in space, thanks to efforts by Boeing and Samsung. The two companies are teaming up to find new ways to incorporate mobile technology and applications into the CST-100 spacecraft, which Boeing is developing as part of NASA's commercial crew program with the goal of ferrying astronauts to and from the International Space Station. Boeing wants to use mobile technology to help future astronauts share their experiences in orbit and make the most of their time in space. Representatives for the company have already identified about six apps that could be used on the CST-100 during flight. Boeing's new CST-100 commercial interior features the aerospace company's sky-blue interior lighting already featured in its modern airliners and uses a large digital display to substitute for passenger windows. Some of the app software — which could potentially be transferred to the Android operating system used by Samsung — is currently used on the space station and was also useful during past NASA space shuttle missions, said former astronaut Chris Ferguson, director of crew and mission operations for the Boeing Commercial Crew Program. For example, an app called World Map allows astronauts to set an alarm that will tell them when the International Space Station flies over a particular part of the world, Ferguson said. "Those geopolitical lines aren't necessarily carved on the Earth," Ferguson said here today (May 20) at the 2014 National Space Symposium. "You have to rely sometimes on a tool to tell you where you are, and there's a great application on the space station called World Map that we would like to bring over to an Android platform. That's an example of how a NASA astronaut would use it." Space tourists might have different uses for tablet technology. For example, private space explorers might be able to capture photos and share them with people on Earth using an onboard Wi-Fi-type tool that can beam back information to the surface of the planet. "There's no telling where this [partnership] is going to lead in half a dozen years, but our intention is to closely mimic what the commercial customer desires on an airliner, to be able to provide them with at least a similar type of service on a spaceliner," Ferguson said. There are also other apps that could be useful in space. For instance, mobile apps could give astronauts information about their vessels and their position in space, as well as help replace the bulky, heavy checklists that astronauts currently need on the station. Ferguson also thinks that, in the future, tablets could even make spacecraft windows unnecessary. Windows can pose risks, he said. "They're heavy. You have to defog them. You have to do a lot of things to keep your window happy," Ferguson said. "What if I just put a camera on the outside and a nice LCD that's perhaps conformal that can wrap on the inside, and I can otherwise see on a screen what I can see outside through the hull? Is that something I could see in the future? Yes, it is." But it might not be that simple, Ferguson added. Windows probably will not be replaced entirely, however — after all, the view from space isn't quite the same when seen on an LCD screen. Boeing is currently competing with other spaceflight companies — notably, SpaceX and Sierra Nevada Corp. — to fly astronauts to the space station under the commercial crew program, which aims to have at least one American spaceship up and running by 2017. In August, NASA is planning to pick a smaller number of companies to continue on in the process. Ferguson said that the CST-100 is currently on track to make its first unmanned flight to space in January 2017, followed by its first manned mission in July 2017.